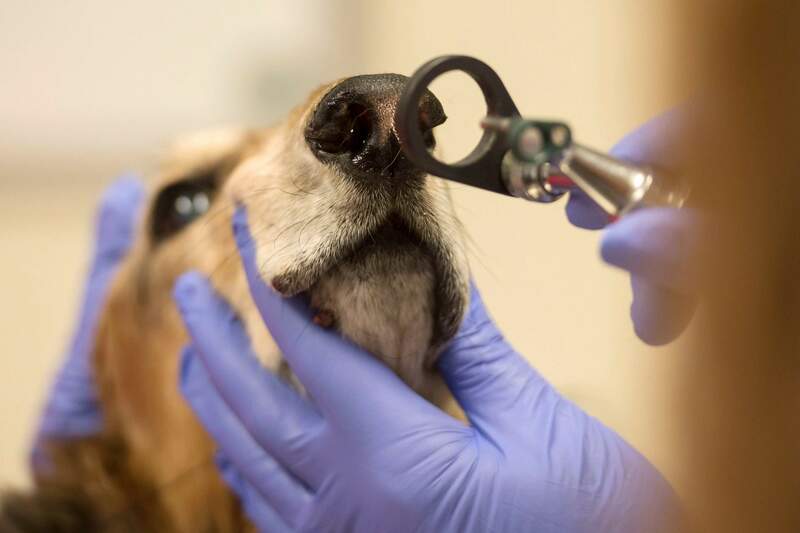 Post-doctoral fellow and Colorado State University veterinary school critical care unit faculty member Dr. Valerie Johnson takes a look at the progress of 12-year-old dachshund Tootle’s nose in the university’s Veterinary Diagnostic Laboratory in Fort Collins. Thanks to a stem cell treatment, vets have been able to manage an infection in the dog’s nose. 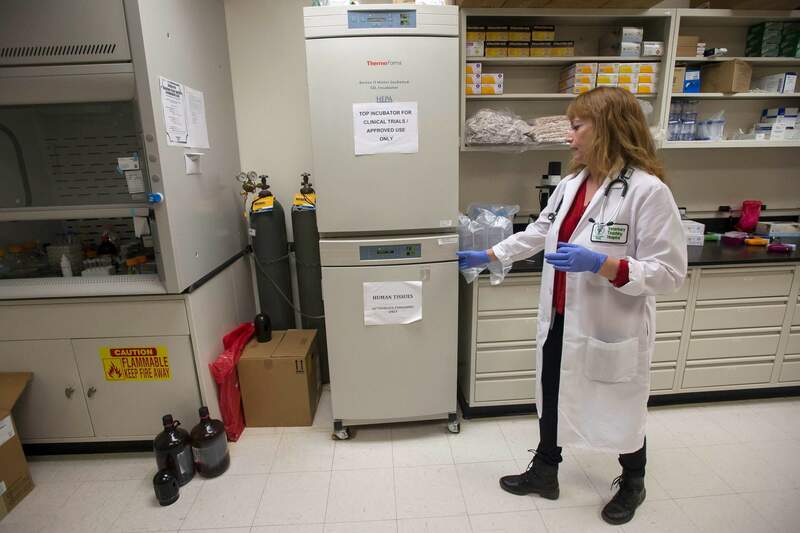 Post-doctoral fellow and Colorado State University veterinary school critical care unit faculty member Dr. Valerie Johnson opens up an incubator where stem cells are being grown in the university’s Veterinary Diagnostic Laboratory in Fort Collins. FORT COLLINS – Tootle used to hate going to the vet. 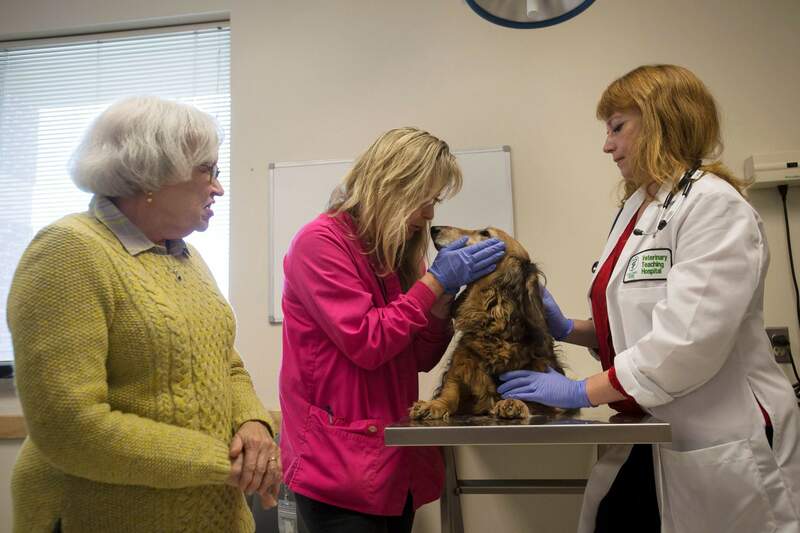 A 12-year-old dachshund named Tootle gets some affection from veterinary technician Tracy Greenwalt during a treatment session while the dog’s owner, Eva Knight, far left, and post-doctoral fellow and Colorado State University veterinary school critical care unit faculty member Dr. Valerie Johnson look on at Colorado State’’s Veterinary Diagnostic Laboratory in Fort Collins, Colo. Thanks to a stem cell treatment, vets have been able to manage an infection in Tootle’s nose. Stem cells already help people with osteoarthritis and big open wounds. In the future, doctors might be able to use Johnson’s research to treat folks with infections caused by implanted medical devices. Johnson volunteers at the Wild Animal Sanctuary in Keenesburg. Many of the big cats, bears and wolves in the sanctuary are older and have suffered severe injuries from a lifetime of mistreatment. Johnson began treating the big cats with stem cells. [mage:3]Wolf’s team took a small biopsy of fat from Boris, she said, and sent the sample to Johnson, who used it to grow stem cells. Johnson then hopped on an overnight flight and arrived at the zoo. They delivered the stem cells through a catheter in Boris’ leg.